There is one thing for certain about life here on Kure; we live in one unbelievably picturesque place. Birds and wildlife aside, this island and atoll offer some of the most breathtaking images one could ever think to lay eyes upon. Precious white sand lines the beaches, reflecting the sun’s light so brightly as if you were to be walking on the rays themselves. Lapping at the tide line is the quintessential knockout blue water known for tropical islands, the mirrored glass surface bleeding the deepest Azul just begging you to stand in awe. Clouds seem to take new form but among all those that streak past the island, the most stunning is the ethereal green bottomed cumulus clouds unique to atolls. As you pan the horizon out over the lagoon, low hung pillowed fluffs of cloud float with their bellies tinted green by the light’s reflection off the water, leaving an image of some green paradise you’d imagine from a fairytale. Mix in the purple horizon on selected days and the red-orange glow of a falling sunset and you are engulfed in a sea of vivid colors here. I see why they say you may leave Kure but Kure never leaves you. These are images forever burned into your retinal databank to be returned to time and time again. So I’ll say it once more; we work and live in one incredible place. Though the winter and its storms loom near, we were fortunate to get in one boat trip this past week before we pull the vessels for the remainder of the season. All eager with excitement to finally get out in the lagoon, the group of us picked out our snorkel gear and loaded up the necessities for a day on the water. After prepping all proper safety equipment and running through procedures, we were off, the seven of us split between a 17’ Twin Vee and an 11’ ridged-bottom inflatable. With calm, shallow waters in the inner lagoon, larger boats aren’t really needed. If you need an idea of what an atoll system looks like, imagine a large circular ring of a surface high coral reef, surrounded by deep ocean on the outside and shallow waters in the middle as the coral acts as a buffer to incoming swells and waves. The day was perfect with calm winds, clear skies, and happy, smiling faces throughout our crew. It was tranquil to be back out on the water, a soothing return to a place seems so familiar. After finding a spot we decided was where we’d get in, the boats were anchored in sand and snorkel attire was quickly dawned. There were plenty of fish to gaze upon and watch dart in and amongst the coral heads. The water was warm and there wasn’t much more one could possibly ask for. After our time in the water, we lounged and gorged on salty snacks, a moment that truly yet weirdly felt like being in paradise. 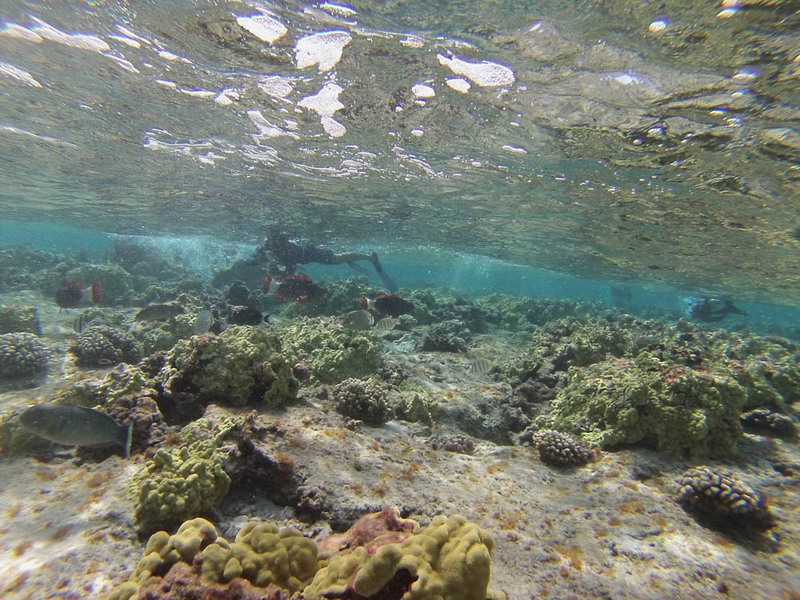 Though the benefit of this excursion was a chance to snorkel along a fringing reef, the primary objective was to search for something other than fish. Unfortunately, the honest truth is that no matter how beautiful this place might be, there is always something ugly, some beast, lying beside you. That beast is marine debris. In snorkeling the lagoon, we are looking to find old lost and abandoned fishing nets that have found their way to Kure. With some an astonishing couple thousand pounds of net, ropes, and floats, it might be clear why we would be searching to remove such a thing. Besides the direct damage these nets can cause on the reef itself, they pose an entanglement threat to marine life including sea turtles, seabirds, and endangered Hawaiian monk seals who use these areas as habitat. When a netball is found, the crew does its best to remove all that it can before it drifts away someplace else. This might involve several trips to collect it all and numbers of breath-dives to cut off manageable chunks to drag it on shore. Millions, if not trillions of feet of line and net float the North Pacific, which is a bit disheartening to think of. Thankfully our boat trip didn’t turn up anything which we hope in a way can be a good thing at least for things here at Kure. Sadly, the beast doesn’t just consist of old nets and line that drift into the reef. Sprinkling the glistening white sand and interior of this island of ours is further evidence of the truth behind marine debris. On a single walk one could find an old washed up shoe and bottles upon bottles of old soda, beer, or something like gin. There are light bulbs, plastic toys, boat parts, and old containers you don’t even want to question what might have been in them. Everywhere you turn is a feeling that civilization isn’t indeed several thousand miles away in any given direction. And with language and origin markings, we know this stuff is coming from the reaches of North America, Asia, and even the main Hawaiian islands. Above, The Beast and what it does – drift nets trap unsuspecting sealife. Predators, including sharks and seals, are drawn into the nets where they too are caught and drowned. Free floating nets that wash into the lagoon catch on and break off coral heads. The coral heads, caught in and suspended from the net, act like wrecking balls as the net is blown around the atoll lagoon by wind, tides and currents, doing extensive damage to the reef. Kure volunteers expend a lot of effort keeping the lagoon clear of these destructive hazards. I apologize for sounding alarmist or a bit pessimistic. The beauty of Kure still shines bright in my eyes, however, those of us here are just aware of something else along with it. The hope though is that a change will come and one day this won’t any longer be the case. Seeing the decayed body of an albatross chick littered with plastic bits, a pill bottle, 10 individual bottle caps, and an old toothbrush ideally will stop being so common. All this serves as a reminder our reach is a whole lot further than we think it to be. That though we might never see a place such as Kure, something from us might still end up making it here. Where my optimism lies is in those green tinted clouds, those crystal blue waters, and pristine images of a place you could only dream to think existed. Relying on a few piercing indelible images forever etched into your mind to keep you moving forward. A once child’s dream that seemingly became a reality; my dream, my reality. I just wasn’t aware of what would come with it. But that there is a beauty so strong and so unquestionably awe-inspiring, I feel a change will come and a bright future is just around the corner. If you needed to know, it’s one reason why I’m here. It is why it is a privilege to try and share this experience and imagery with you. Close your eyes and for a minute and dream of the beauty we’re seeing. We all wish you could be a part of it.